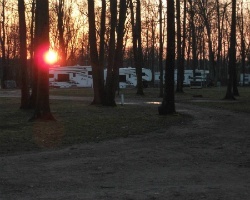 The *Heartland Resort* is a wonderful outdoor experience for campers with all its tall timber and scenic splendor! Located in beautiful Stockbridge, Michigan, the resort has a large lawn amphitheatre and covered sound stage for outdoor concerts and special occasions. Within a few miles are many fishing and boating lakes for a total outdoor experience. For NASCAR enthusiasts Michigan International Speedway is just south of the Resort on the outskirts of Jackson. Amenities Include: A spacious clubhouse, two outdoor swimming pools, picnic area, shuffleboard, adult lounge, horseshoes, stocked ponds, playground, miniature golf, outdoor lawn theater, camper store, game room and five boating and fishing lakes nearby. There is live entertainment most weekends and regular volleyball tournaments. Annual floating week! Ideal outdoor lover's retreat!